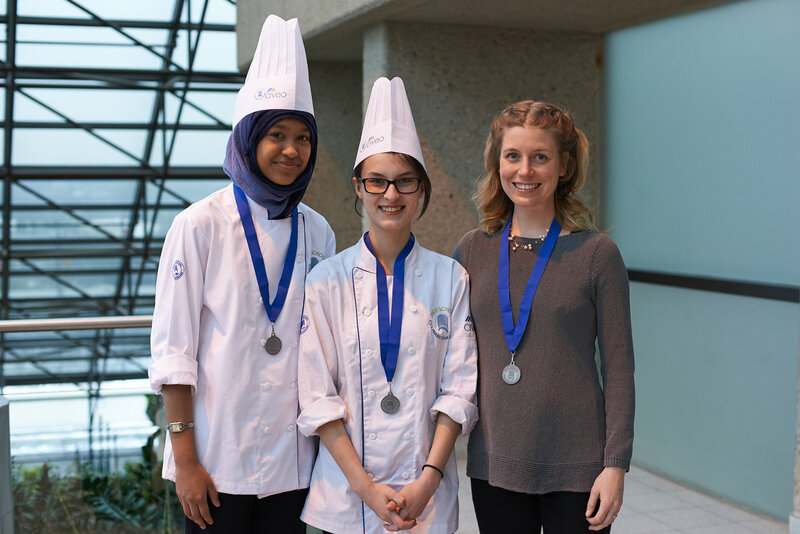 The culinary team from Edmonton’s Jasper Place High School defeated 17 other teams to take gold at the High School Culinary Challenge Awards Dinner Monday, March 7. Silver went to Louis St. Laurent and bronze went to Harry Ainlay High School. This is the second year in a row that Jasper Place has taken top prize. Teams competed by cooking a three course meal on February 6 at NAIT’s Hokanson Centre for Culinary Arts and were judged on preparation, timing, sanitation, presentation and of course taste! eligible to apply for culinary scholarships upon completion of the challenge. At the awards dinner, four scholarships were awarded to attend NAIT’s culinary apprenticeship program, where students benefit from learning on the job with some of the area’s top chefs. The High School Culinary Challenge is helping to ensure that there will be new and innovative young chefs in Edmonton. The competition wouldn’t be possible without generous sponsorship support from Civeo; a global workforce accommodation specialist that helps people maintain healthy, productive and connected lives while living and working away from home. No Replies to "Jasper Place High School Takes Culinary Gold"